Continuing with talks about introducing an off-highway vehicle bylaw, the Municipal District of Taber council were still on the fence if they wanted to move forward. During their policy meeting on August 7, councillors once again had the opportunity to discuss the positives and negatives to enforcing a bylaw revolving around the use of off-highway vehicles on their roadways. Stemming from prior discussions around the topic, administration brought back an updated bylaw based on councillor discussion. “The last policy committee meeting, additional information was requested from other municipalities on off-highway vehicle bylaws. 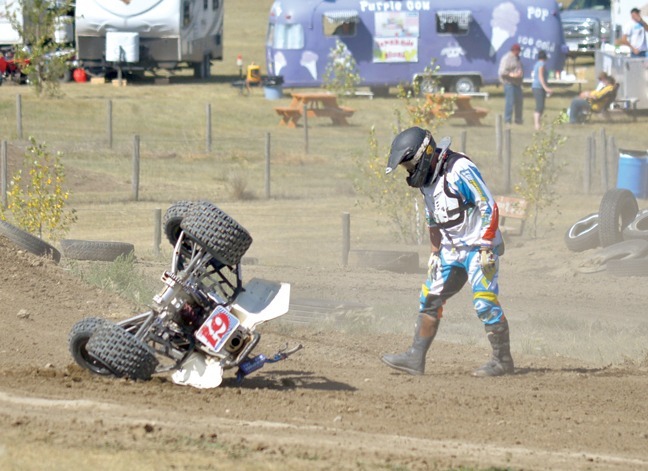 County of Lethbridge had no information on this matter, County of Warner recently updated their bylaw which was just adopted, County of Forty Mile no OHV bylaw has ever been considered, Cypress County indicated no OHV bylaw,” said CAO Derrick Krizsan. In other discussions with municipalities, Reeve Brian Brewin heard that a bylaw wouldn’t be needed as it was already in place by the province. “I talked to the reeve and council members when I was in Cypress for the IDP (Intermunicipal Development Plan), their feeling was we didn’t need one, it was already covered provincially,” he said. While there was wording in place from the province, administration explained that a bylaw from the municipality would be needed if they wanted to allow off-highway vehicles. “The Traffic Safety Act is enabling legislation, so it means it doesn’t become applicable to the municipality until they enact a bylaw that permits the activity,” explained Krizsan. With the M.D. area being a prime agricultural area, off-highway vehicles can be seen throughout the region used as means to traverse fields. As most M.D. councillors come from ag backgrounds, they realize that ATV’s and other similar vehicles are necessary as a business tool. “I don’t know why we’re trying to regulate something that hasn’t been regulated for how many years. Not sure why it would be necessary to have one,” said Deputy Reeve Merrill Harris. With the way things are right now, off-highway vehicles are illegal to operate on roadways which spurred the conversation in the first place. Even with the knowledge that they are being used through the entire M.D., the majority are being used in agricultural settings and enforcement hasn’t been a top priority. Enacting a bylaw would permit them on the roads on the capacity which council agrees upon, with prior discussion highlighting the wording to revolve around only allowing them in work-related situations. One concern brought forward was the fear of seeing an increase of ATV traffic on M.D. roadways if the bylaw was passed through. “Right now, the in the hamlets they aren’t allowed so then the hamlet owners are going to be out on our roads too,” stated Coun. Murray Reynolds. Most other councillors were also swaying towards not pursing the bylaw any further. “People will do it either way. We have speed limits for reason but that doesn’t mean people aren’t speeding. I just think as a safety thing, I think it will increase traffic because once people find out, they will go out and say ‘I’m just checking a field’ and everyone will be saying that. There won’t be any way of checking, the CPO’s will just have to take their word for it,” said Coun. Leavitt Howg. While council was struggling with how to proceed, Brewin suggested bringing the topic to their next annual general meeting, which would take place early next year. Seeing as the bylaw would have an effect on a variety of M.D. residence, council agreed they should hear out their ratepayers on how they feel they should proceed. “I would like some public consultation on this, I think it’s an important element that we’re missing,” said Coun. John Turcato. A motion was made to bring the topic to the next M.D. annual general meeting with amendments and was passed unanimously.